Bathsheba can have one of them, all of them or none of them, but what are the consequences of her actions? To start with, Bathsheba is a difficult character to like. One of the reasons I appreciated the Hunger Games books is that Katniss Everdene (named for the Hardy heroine) shares the same awkward unlikableness, but both have a quality to make you not only stick with her but also identify. She's a woman who has been given unbelievable choices in a time when she can't have expected anything like that and she's too young (and female) to have experience that will make her ability to choose possible. I'm not sure I was completely won over by Carey Mulligan's portrayal but she does have ample apple-cheeked charm and looked determined as she dipped sheep, drove a wagon and sold grain. I'd marry him just for the wallpaper. 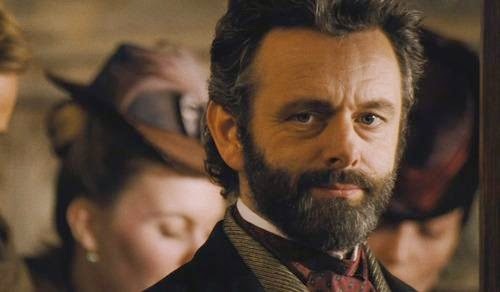 As for her three suitors, I felt that Michael Sheen stole every scene he was in and I would have married him without question. That's just me and I may have been hepped up on giant chocolate buttons when I thought that. Boldwood is meant to be the least appealing physically and he was the beardy one stuck between two gorgeous young chaps. However his slow derailment at the fickle hands of Miss Everdene was just heartbreaking. When he stands up and sings with her despite being so cripplingly socially awkward, you can't help but feel for him. The final discovery in his house at the end made us weep when it could have so easily come off as creepy and weird. Just as Tom Hollander made you feel guilty for finding Mr Collins in Pride and Prejudice vaguely appealing, Michael Sheen makes Boldwood blameless and wonderful, despite it all. 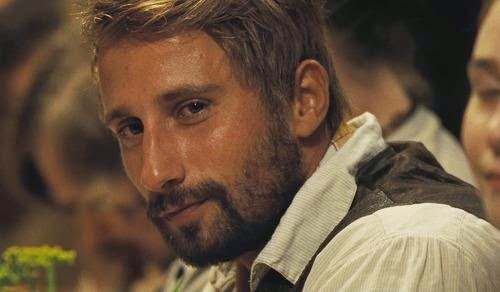 Last seen in A Little Chaos, Matthias Schoenaerts does a lovely, if stoic, job as Gabriel. Enormous, dependable and fond of his dog, he is the perfect man for Bathsheba, but she has to take two hours to realise it. I was sorry they missed out the part early in the book where Bathsheba saves Gabriel's life because it gives more of an idea about how equal they are in terms of strength and ability to do right by people. I'm guessing it would be a bit of a stretch to imagine tiny Carey being able to shift the poor chap. Gabriel has what feels like only a handful of words to say in the film, but his goodness influences both Bathsheba and Boldwood, but not Troy which immediately tells you who is the bad apple. I was sorry he did not have a west country accent as it is something I love about a Hardy film, and I did feel a little unconvinced by the passion between Bathsheba and him when they finally did admit their love. However, he did love his dog. I was completely convinced by that. As with all 'Wessex' films, the countryside is very important. I was sorry there was not any recognisable landmarks, such as Maiden Castle, in this one, but the use of colour was gorgeous. All was green, grey, blue and brown, making Troy's red coat stick out so badly as to alert you to his danger. 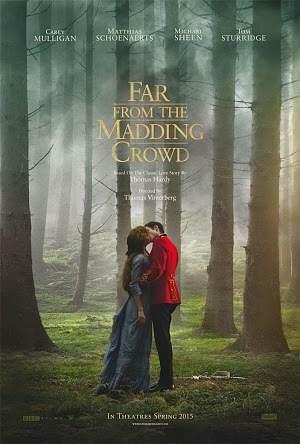 The film poster uses the moment in the forest when he is there at odds to all that surrounds him and yet irresistible. All the costume was beautiful but that bloody red jacket put you on edge every time you saw it. The supporting cast were familiar and marvellous. Juno Temple made an ethereal Fanny Robbin, not as silly as previous interpretations of the part, and given less screen time than she deserved. Her fate and its effect on the characters was somewhat lessened by the brevity of her introduction but still she had an Ophelia-esque quality to her wedding gown that was nicely foreboding. My absolute favourite character has to be Liddy, cheeky wing-woman of Bathsheba, queen of the withering look and splendid bonnet. Jessica Barden will be instantly recognisable to Hardy film fans as the appalling Jody in Tamara Drewe, a modern-day version of the same story (and possibly my favourite Hardy adaptation). Hardy story's rely on the subtle humour injected in the narrative by side characters and Liddy wonderfully fulfilled that role. 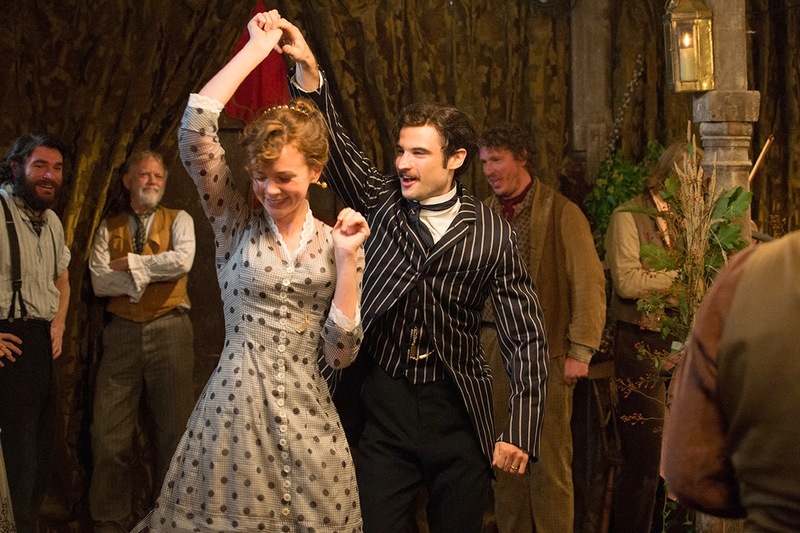 You need the humour in order to provide depth to the tragedy and although Far from the Madding Crowd is not as heart-stomping as Jude the Obscure, moments like the fate of Young George (*sob*) and Fanny Robbin (*sob sob*) need a bit of lightness to prepare you for the ending. This version of the story might not have anything new and revolutionary going for it but it is gorgeous to look at and skilfully handled. 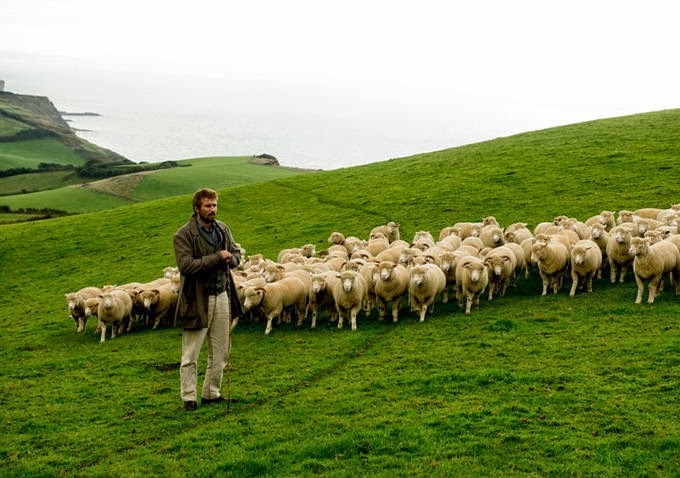 A stand-out performance by Michael Sheen makes this a must-see and anyone who fancies a wallow in gorgeous scenery will love the green and pleasant land on show here. Take chocolates and a hanky and get comfy, you won't be disappointed. Ghod! I must go see it, and soon. It's one of my favorite novels. Oh do! It's lush and delightful. I remember going to see the original film. (Julie Christie, Peter Finch and Alan Bates version), on my grandparents recommendation. Absolutely loved it. I seem to recall the critics of the time were quite lukewarm about it, then after a passage of time it has become a classic! It was the first film that I saw that I felt created an authentic Victorian atmosphere. I was transported back to those days. The film has stayed with me ever since. Unfortunately it doesn't seem to get much airtime on TV. I thought it was a great film - beautifully filmed, wonderful cinematography. I thought all the acting was great even Carey Mulligan who I don't rate at al normally, was adequate. I did feel that the plot was creaking towards then end. I'm sure the Brontes wouldn't have let it all work out so neatly. But thanks for a great review! BTW, are you watching Jonathan Strange and Mr Norrell? Look forward to your review of that one! I remember the original film was doubtful about the new one but really enjoyed it. Marion, I quite understand. Michael Sheen was absolutely perfect and worth the ticket price alone. Amazing to think Hardy visited a film set for Tess - are details about this anywhere? Fascinating. COULD a modern-day adaptation possibly match up to a classic film of a classic book? Honestly, it is a rare film that in anyway matches up to a book because books tend to deal so much with the internal which simply can't be replicated visually, in most cases. I think the best you can hope for is a good interpretation to act as a companion piece. I don't really hold that a great film of a book can't be made now, that it has to be old, just that maybe because straightforward adaptations exist from the 1960s or before, they try different approaches. Sometimes it works, sometimes it detracts from what is great about the book. A lot still hangs on a damn fine performance, which can make you see a classic story in a different way, like Michael Sheen here. I just loved the way the review has been written! Loved each word in it!